South Korea isn’t a name on everyone’s lips when it comes to soccer producing nations. However one superstar it has produced is none other than Park Ji Sung. The South Korean is the first Asian player to win the Champions League title in Europe. To this day he remains the most successful Asian soccer player in history. Currently he is a club ambassador for Manchester United post retirement. Known for his exceptional fitness levels as an athlete and off the ball movement, he was nick named Three Lungs Park due to his high levels of endurance on the field and speed agility. Park also developed a reputation for having one of the strongest work ethics among all soccer players, a fact he was deeply respected for as well. Born in February 1981 in Goheung, South Korea, Park began his initial foray into soccer by playing in Japan. Park was a little bit on the shorter side while growing up and in order to qualify for good soccer clubs he ended up drinking and eating e everything from frog juice to deer blood in order to grow a few extra inches taller. After finishing his high school Park enrolled in Myongji University where he played soccer for his university’s team. He attracted the right kind of attention as he was scouted by a club and made his national team debut in 2000. Soon he joined the Kyoto team in Japan and his strong presence enabled the team to win the J League Division 2 title in 2001. He was also named the MVP of the 2002 Emperor’s Cup. It was the 2002 World Cup where Park made an international mark. He made the thrilling goal against the deciding match against Portugal which sent South Korea into the next round and eventually fourth place in the tournament – a first in the nation’s history. After the World Cup success Park joined the PSV Eindhoven club in Netherlands. With Park playing a vital role, PSV ended up winning a pair of league titled and the KNVB Cup from 2002-2005. This was followed by his legendary joining of Manchester United in 2005. Under Ferguson’s supervision Park was able to perform to the fullest and was guiding the team to three consecutive league titles in a five year draught of no titles. He became the first Asian to play in the Champions League final and the first to hold the trophy. During his years at Manchester United also made him into a bona fide European star. On the international front he became the first Asian to score goals consecutively for his team in three World Cups. 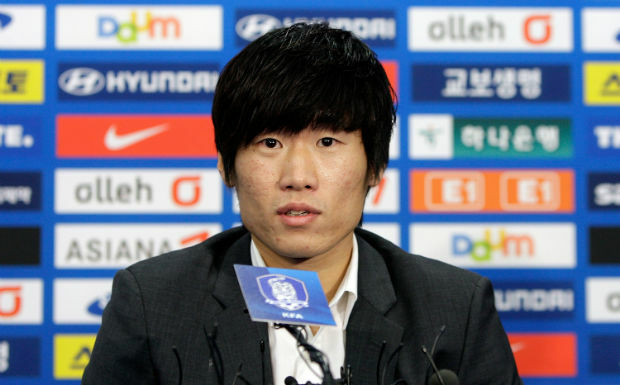 He made a record 100 appearances for South Korea before retiring from the sport in 2011. Park has won the Peace Cup Golden Ball in 2003. He was also shortlisted for the Ballon d’Or in 2005. FIFA named him as the Best Asian Player in Europe in 2007. He was the KFA Footballer of the Year in 2010.